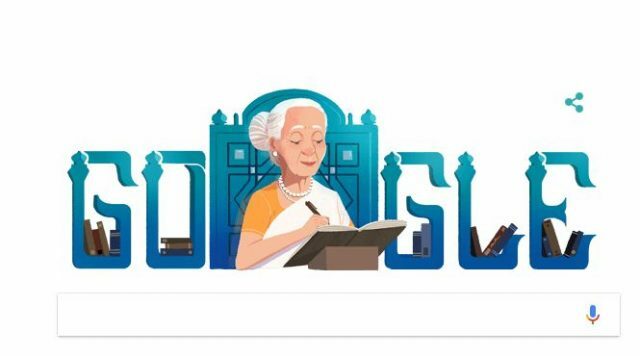 Keeping up with its tradition of recognising and paying homage to famous people across the globe, Google paid homage to late Pakistani Urdu novelist and playwright Fatima Surayya Bajia with a colourful doodle on what would be her 88th birthday on September 1. The doodle depicts Bajia wearing a white and yellow sari, holding a pen and writing in a notebook. Bajia passed away on February 10, 2016 after a prolonged illness at the age of 86. She was a well-known personality in social welfare, literary radio, television and stage. She wrote for PTV Centres in Islamabad and Lahore since beginning of the state-run channel. Some of her popular drama serials include Shama, Afshan, Aroosa, Tasweer, Zeenat, Ana, Aagahi, Aabgeenay, Babar, Tareekh o Tamseel, Ghar Aik Nagar, Sassi Punno, Anarkali and Auraq. Other Pakistani artists Google has honoured with a doodle include singers Nazia Hassan, Noor Jehan and Mehdi Hassan, Qawwali maestro Ustad Nusrat Fateh Ali Khan, and calligrapher and painter Sadequain.